The first letter from the Governour assured us of the Princes taking Stopford, where he disperst two thousand of the Rebells forces being Cheshire and Lancashire men, and gave the plunder to his Souldiers, sleighted their works, and the next day marched into Lancashire without any opposition, the other letter Dicke Greene brought who came from Latham yesterday wherein the Goveruour assured us of the Princes taking Bolton, wherein were three thousand, which upon the Princes coming into Lancashire raised from Latham, and came thither under the Command of Righy, His Highnesse sent to summon it and they basely put to the sword his messenger, whereupon he charged into the towne himselfe with his [here a line of text is unreadable] of some sixty men, the greatest of any quality being a Captaiue Lieutenant to Robin Ellis, tooke the towne, killed dead upon the place above twelve hundred, tooke seven hundred Prisoners, and two thousand Armes, it being a very rainy day the Souldiers went up to their very works, and beat them off with their swords and their but-ends of muskets, the Foote behaved themselves very well, having beene beaten off twice, and tooke it the third time, we tooke two and twenty Collors from the Rogues, Sir Thomas Tyldesly the very day after his coming into Lancashire recruited his Regiment from three hundred foote to twelve hundred, which came unto him well armed. My Lord of Derby upon Friday had a muster at Ormes-Church, wherein came above three thousand men, and most of them Armed, and tendred their services to live and dye with him. Sir Gilbert Haughton being high Sheriffe of the County, the County comes in great numbers to him. My Lord Mullineux daily recruites his Regiment about Leverpoole. 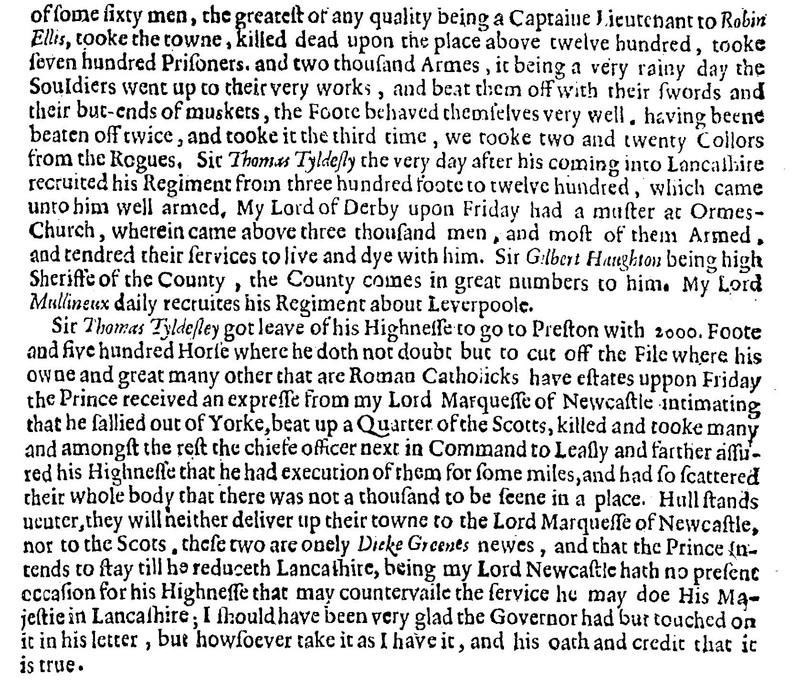 Sir Thomas Tyldesley got leave of his Highnesse to go to Preston with 2000. Foote and five hundred Horse where he doth not doubt but to cut off the File where his owne and great many other that are Roman Catholicks have estates uppon Friday the Prince received an expresse from my Lord Marquesse of Newcastle intimating that he sallied out of Yorke, beat up a Quarter of the Scotts, killed and tooke many and amongst the rest the chiefe officer next in Command to Leasly and farther assured his Highnesse that he had execution of them for some miles, and had so scattered their whole body that there was not a thousand to be seene in a place. Hull stands neuter, they will neither deliver up their towne to the Lord Marquesse of Newcastle, nor to the Scots, these two are onely Dicke Greenes newes, and that the Prince intends to stay till he reduceth Lancashire, being my Lord Newcastle hath no present occasion for his Highnesse that may countervaile the service he may doe His Majestie in Lancashire; I should have been very glad the Governor had but touched on it in his letter, but howsoever take it as I have it, and his oath and credit that it is true. 1. 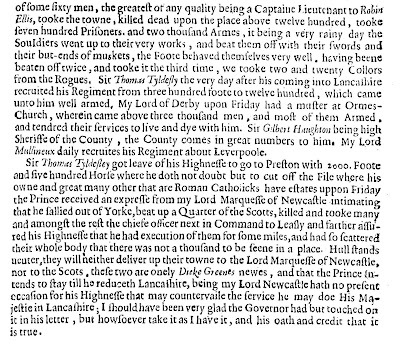 A CONTINVANCE OF THE ENGLISH NEWES, And especially what noble exploits hath beene acted by His Majesties Army, but chiefly in the moneths of May and Iune, 1644. taken out of severall letters written from Chester, the eighteenth of Iune, 1644.